Conduct your job interview follow up with enthusiasm, determination and in a professional manner and provide the interviewer with further evidence of your suitability. The after interview follow up is an opportunity to demonstrate your commitment and expertise and set yourself apart from the other candidates. Take the time to follow up in a proper manner and improve your chances of getting the job you want. You have sent your interview thank you letter and now comes the tough part - waiting for feedback! What happens between the first job interview and making the hiring decision will vary from company to company and position to position. When closing the interview you probably asked for information about what happens next in the interview process. How do you conduct yourself in terms of this process? When and how should you follow up after the interview to keep the focus on your application but to avoid becoming annoying? Use one of these excellent sample follow up letters and emails to follow up immediately after the interview. How soon should I follow up after the interview? If you know approximately the time frame for the hiring decision you will have a better idea of when to follow up. For example, if the company have told you they expect to make the decision within the next week you will need to follow up after a couple of days. If it is a longer time frame or they have not given you a specific time frame it is usually best to wait about a week before making contact. Should I wait for the interviewer to contact me? You need to make contact to know what is happening and to keep yourself in contention for the job. Use this initial job interview follow up to highlight your enthusiasm for the position and to get more details about the status of the hiring decision. The company may have specified at the job interview that they would prefer it if you did not contact them and to wait for them to come back to you. At the interview close ask when you can expect to hear from them. 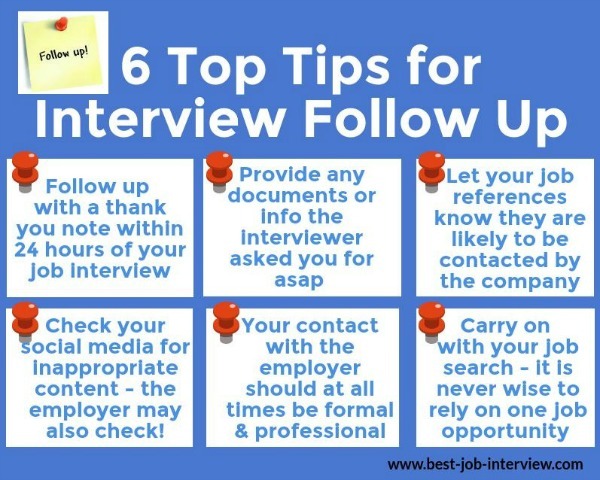 Wait a couple of days beyond the date given and if you have not been contacted follow up with a call to the interviewer or even human resources. Politely ask about the status of your application. This courteous job interview follow up inquiry should prompt some feedback about the position. If there is still no information, ask for a specific date to phone back to get feedback. 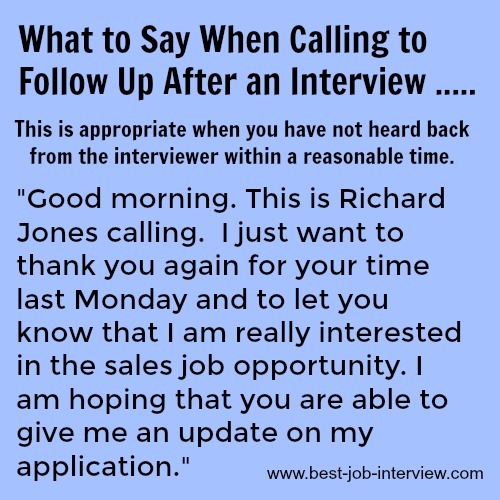 What should I say in the after interview follow up call? You can thank them again for the interview and restate your interest in the position. Find out if you are still under consideration for the position. Ask if there is any further information they need. Find out when you can expect a final decision. You want to show the interviewer that you are interested in the job but avoid sounding desperate. Be polite and professional. Can I follow up with an email? Sending a polite and brief email is an alternative to making a call. Thank you again for the time you spent with me on Thursday. I enjoyed the interview and would like to restate my interest in this opportunity. Please could you call or email me with an update on the job opportunity at your earliest convenience. You can also use the opportunity to highlight your suitability for the position. The job we discussed last week is both an interesting and challenging opportunity. I have been reviewing the job requirements and I am enthusiastic about my ability to perform successfully in the position. I look forward to hearing from you with regard to the status of my application. Please contact me should you require any additional information. You will find good examples of interview follow up emails for your own use. Use your job references to support your job application. Following up after sending your resume is important. 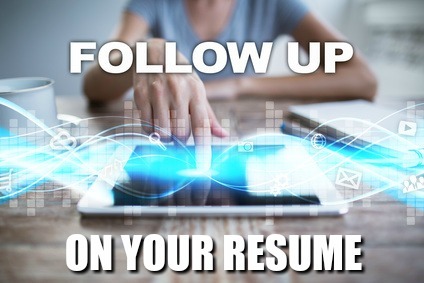 Use this sample follow up on resume email to find out the status of your job application. A successful candidate does not sit back and wait once the interview is over. Proactive job interview follow up demonstrates both your commitment and your professionalism to the company and gives you the edge over the other candidates.